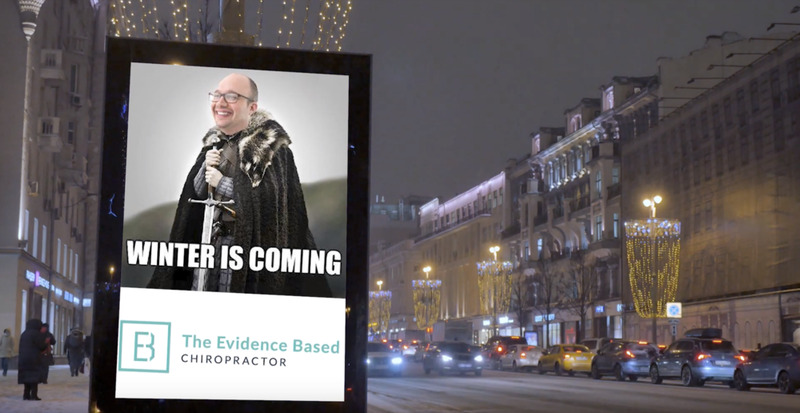 Designing a chiropractic logo can be challenging! You probably spent more time in the clinic than at the museum of modern design. This article is intended to simplify the process for you. I'll help you discover the three key design elements that will help make your chiropractic logo stand out and make a lasting impression. Also, we'll look at some examples of what not to do when creating a logo that will represent your business for years to come. Creating a chiropractic logo for your practice that can stand the test of time and perhaps even last your entire career isn't easy. So we're going to go through the three key things that you need to keep in mind as you go through that process to make sure you get the result you desire. Now whether you are a new doc just starting out or maybe a doc who's getting ready to rebrand your practice, deciding on a logo can be one of the most intense times in anyone's practice. You want to make the right decision. You want to make sure it's going to be something that you can be proud of, and that's it's not going to look dated and drab in a few years. This is so important because the branding and logo of your practice are going to be on every piece of marketing material that you get out to the people in your community. That's why it's so important to do it right the first time! There are three key things that you can keep in mind as you go through your process to make sure you get a fantastic logo that will make you proud. Number one is looking out for clean design. Ever notice how the suits Frank Sintra wore in the 1950's look just as sharp today. It's all about clean design. He wasn't wearing a frilly Seinfeld-esque pirate shirt. It was clean and straightforward. So make sure that your logo is not too intricate. This is a common problem I see with a ton of chiropractic clinics. Especially when you want to incorporate a spine when you get small, and that image gets smaller, and you try to get it into the top of a paper, or you try to get it very small on a shirt. It just becomes a blurry mess. Keep in mind that cleaner design enables your logo to be seen very quickly and very easily if you think of some of the biggest companies that you know Nike has the check or the swoosh. McDonald's is the M. Google is the G. There is a clean aesthetic design where it does not get messy. It does not get blurry regardless of how it is utilized a clean design is number one. Number two is making sure that you can break apart the image and the text. So a lot of times you might have a brand name for your practice and then a small icon. Be sure that you can break those apart. Depending upon how you want to utilize your logo- if the logo is too tall or too wide you can become jammed into a sloppy final product. But when you can take the little icon and maybe move the words to the left move the words to the right or keep it centered and balanced, you have the opportunity to utilize your exact branding your logo your icon on all your merchandise and marketing materials without having to compromise on aesthetics. When we're talking about logo and branding it's all about aesthetics; so make sure that you can break up the words and the little image or icon so you can utilize it with all of your marketing channels. Number three make sure that your logo and branding match the aesthetic of your clinic. If you have a clean, modern practice, make sure that that logo is clean and contemporary. This simplifies the process and friction for consumers or future patients. Consequently, if you have a rustic office don't hesitate to go rustic with your logo. There are still ways to make that look beautiful. But keep in mind that the branding and the colors of your logo should very much mirror what people are going to see and experience when they come into your practice. When they receive something via e-mail, go in for a visit, or check out your website, everything should be unified. That is what establishes branding. It is the unification of your aesthetics and messaging. Photoshop…or did this happen in real life? BONUS TIP- Got to keep them separated! Whether your logo designed was sourced from Fiverr or if it's an independent designer, make sure that you get one copy without the background. I've seen too many practices where they have a nice beautiful logo, and it's just on white. And they're trying to use it on something that's not white like a shirt, and they end up with a white square on a dark shirt with a logo on top. There are plenty of programs where you can strip the background cleanly and efficiently, but while you're at it, ask your graphic designer. Creating a logo, and branding are a few of the most important things that you can do as you establish your practice and also as you grow and evolve. But keep in mind clean design wins the day. These quick tips will get you 99 percent of the way there! I'd love to see your logo, and I'm happy to provide any feedback as well. Drop them down in the comments below. I'll take a look, and I'll answer any questions that you may have.